Judge Dredd Celebrates 25th Anniversary! Everyone’s favorite fascist, Judge Dredd, is having his 25th Anniversary. 2000AD is releasing Judge Dredd Megazine #365 with a special cover by Barry Kitson (above) featuring Dredd – having disposed of a myriad of past foes – looking to the future and the taking down of many, many more. Judge Dredd Megazine #365 hits comic shops tomorrow. for further details, follow the jump. 2000 AD’s sister comic, Judge Dredd Megazine, celebrates its 25th anniversary this Wednesday – with a special cover by artist Barry Kitson. The veteran artist on Judge Dredd, Anderson: Psi Division, Fantastic Four, and The Amazing Spider-Man has returned to the ‘House of Tharg’ after 23 years to produce an image of Dredd having bested many of his most dangerous foes, before beckoning the next generation of villains to try their best. Launched in 1990, the monthly Megazine has published some of the most seminal Judge Dredd stories of the past four decades, including ‘America’, ‘Young Death’, and ‘Bury My Knee At Wounded Heart’. Its first issue in October 1990 featured the artistic talents of Glenn Fabry, Sean Phillips, John McRae, Peter Doherty, Cam Kennedy, and Jim Baikie. Over the past 25 years it has also debuted popular characters such as Gordon Rennie and Frank Quitely’s Missionary Man, Simon Spurrier and Fraser Irving’s The Simping Detective, and Dan Abnett and Phil Winslade’s Judge Metta Lawson. 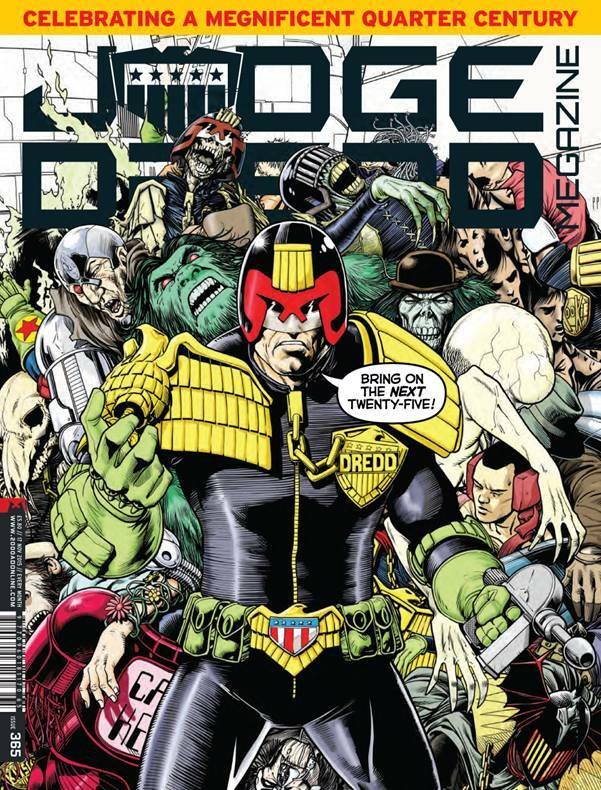 The special cover by Kitson features 25 of Dredd’s all-time greatest villains, including: Kraken, Judge Death, Judge Fear, Call-Me-Kenneth, Judge Mortis, Mean Machine Angel, Trapper Hag, Fink Angel, The Judge Child, Stan Lee, Chief Judge Cal, Judge Fire, Captain Skank, Sabbat the Necromancer, Judge Rico Dredd, Don Uggie Apelino, Father Earth, PJ Maybe, the Mutant, the zombie Dredd from City of the Damned, a Sov Judge, Pa Angel, Whitey, and several more… with city blocks in the background named after John Wagner and Alan Grant, paying tribute to the two scripting titans of Dredd’s world. This month’s issue sees the start of a stunning new Dredd thriller, ‘Terror Rising’, by the ‘America’ team of John Wagner and Colin MacNeil; Brit-Cit Psi-Judge Lillian Storm goes underground in her pursuit of the mysterious box in ‘Storm Warning: The Relic’ by Leah Moore, John Reppion and Tom Foster; Colonial Marshal Metta Lawson has more than her hands full keeping the town in check as the carnival kicks off in ‘Lawless: Between Badrock and a Hard Place’ by Dan Abnett and Phil Winslade; and ‘Demon Nic’ faces the Assassin Apostles, by Paul Grist! Plus, in the bagged graphic novel this month, we catch up with Carl and Kilquo in the ‘Freaks’ sequel ‘Faces’ by John Higgins and Mindy Newell. Judge Dredd Megazine #365 is on sale this Wednesday from all good newsagents and comic book stores, as well as digitally through the DRM-free 2000 AD webshop and the 2000 AD apps for Apple and Android devices.